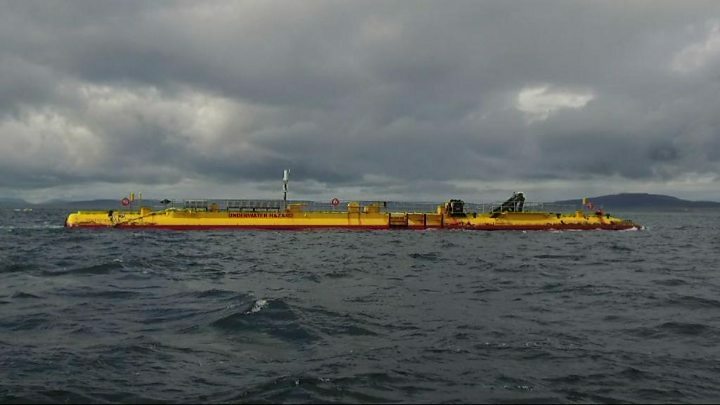 The Scotrenewables SR2000, with its 2MW turbine, was installed in the sea off Orkney in 2017. It has now generated three gigawatt-hours (GWh) of electricity from near continuous operation, its owners said. It is estimated the seas around the UK could one day be capable of generating 20% of electricity needs. The European Marine Energy Centre (Emec) in Orkney has tested 30 different devices since it was launched in 2003. Between the rest of them, they have generated 2.8 GWh hours of electricity. But the latest full-scale prototype, at 63m, has so far proved to be the most successful. Andrew Scott, chief executive officer of Scotrenewables Tidal Power, said: "It is a phenomenal result. For one, we've had continual generation or testing for a year. That's fairly unique in this sector. "We've generated over three GWh into the Scottish grid. "That's more than three times any prototype system that's come before us and, in fact, cumulatively that's more power generated in 12 months from this single turbine than the entire wave and tidal energy sector has done in Scotland in the 12 years preceding the launch of this turbine." The company believes the key to its success has been the design of the generator which is significantly different to previous tidal systems. Older prototypes involved machines - similar to wind turbines - being fixed to the seabed. However, the SR2000 more closely resembles a boat with the rotors hanging from a device which floats on the surface. That makes it easier and cheaper to carry out maintenance because moving parts are more easily accessible. Mr Scott added: "We've taken a very novel approach and we believe we've got a very disruptive technology in that space." Image caption Those testing tidal energy technology say the machines involved will get "bigger and bigger"
The device was installed in the Fall of Warness, west of the island of Eday, in August 2017. It can typically generate 7% of Orkney's electricity but at points has been able to power more than a quarter of the area's homes. But because it is still in its infancy, the power is still expensive to produce compared with wind. The industry experienced a significant setback four years ago when wave firm Pelamis went into administration after failing to secure investment. But the Orkney site has recorded several '"firsts" including the recent success at creating hydrogen from marine power. Gina Hanrahan, from environmental charity WWF Scotland, said: "As we transition to a wholly renewable electricity system, it's really important that we have a diversity of renewable electricity sources. "We've seen huge growth in onshore wind and offshore wind over recent years and it's great to see new tidal technologies now hitting new milestones."